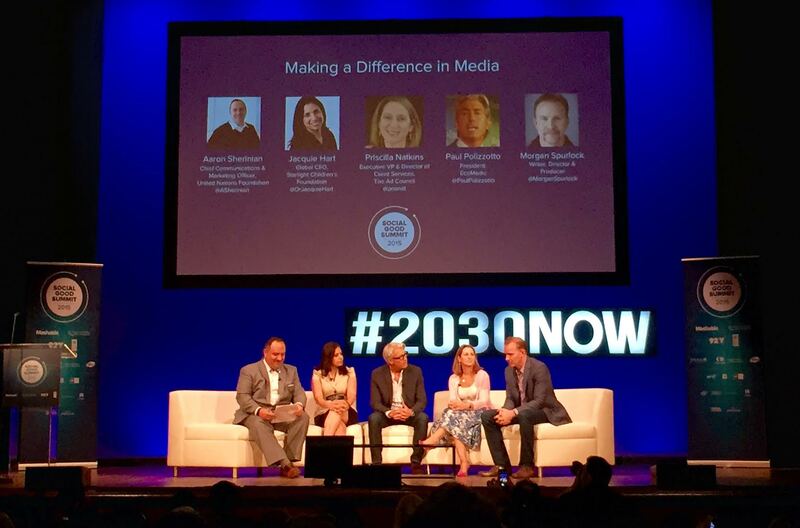 We dropped by the recent 2015 Social Good Summit to hear some incredible people speak about how technology and new media are driving socially good initiatives around the world. Climate change, female education, data equality and humanitarian aid – particularly around the refugee crisis – drove a great deal of the conversation. Notable speakers included former U.S. Secretary of State, Madeleine K. Albright on the future of humanitarian aid, Morgan Spurlock shared some knowledge about how to use content to reach audiences and Executive Director of Greenpeace International, Kuma Naidoo on climate change and the struggle for justice. Then there was eleven-year-old Vivienne Har, who at the age of eight raised $100K to fight child slavery with a lemonade stand and has since launched a social network for charitable giving. Gender equality requires data equality. There were a number of conversations about how to best use data to solve problems, but more prevalent was the issue that largely, we’re not collecting the right data to even understand the issues at hand. Laverne Cox lead a discussion around data equality and the lack of data on the transgendered community. The U.S Census Bureau survey currently doesn’t offer any questions that identify transgendered individuals, and this is largely a global issue. Shelby Chestnut of the NYC Anti-Violence Project noted that without data capturing crime rates, suicides or career and housing-related acts of discrimination on the transgendered community, we can’t truly understand the issues they’re facing or create better programs to support their needs. Content and context are key to mobilizing the masses towards action. When pressed about whether short-form content dilutes the complexity or gravity of a cause, Spurlock argued that breaking down issues into bite-size vignettes is far more accessible to the masses. Priscilla Natkins, EVP of The Advertising Council, echoed Spurlock’s views on empathy-driving content, but also noted the huge opportunity of social platform-first initiatives that offer external validation to those who participate, like that seen in the Ice Bucket Challenge. “Slacktivism” isn’t as slack as we thought. An ongoing discussion point at SS+K is the idea of “slacktivism” – a common ask by many issue and political-driven causes, where users are urged to “sign a petition” or “tweet a hashtag” to show their support. While many traditional activists see this ask as a passive solution that doesn’t truly solve the problem at hand, in recent months the power of digital and social platforms to mobilize a group towards driving awareness has seen positive change, globally. Executive Director of Greenpeace International, Kuma Naidoo spoke about Greenpeace’s recent success forcing multinational oil and gas company, Shell out of a proposed plan to drill for oil in the Arctic seas. Shell claims the up-front investment in the venture wasn’t worth the potential return. However, Naidoo argued the efforts of over seven-million people who signed the petition and countless others who took to their social channels under #SaveTheArctic campaign were instrumental in raising public awareness and pressure on the energy giant. While many cause-driven groups focus on leveraging their audiences to drive awareness or donations, Sienna Miller, actress and Global Ambassador for the International Media Corps argued the focus should really be around driving advocacy for political solutions. While it was evident from many speakers at the Social Good Summit that political action was the end goal, how exactly cause-driven brands translate empathy and audience action into real political change is yet to be solved. It’s a complex issue, and something we hope will be a chief focus at the next event.